Making it special for you. 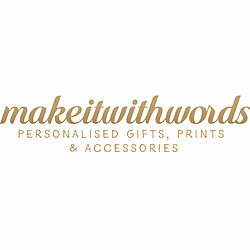 Make It With Words was founded in 2014 by husband and wife team Joe Jennings and Amelia Mantero. Joe’s background in Graphic Design and Amelia’s experience in retail was the ideal combination when they were trying to find a truly unique Christening gift that they could put our own personal stamp on. 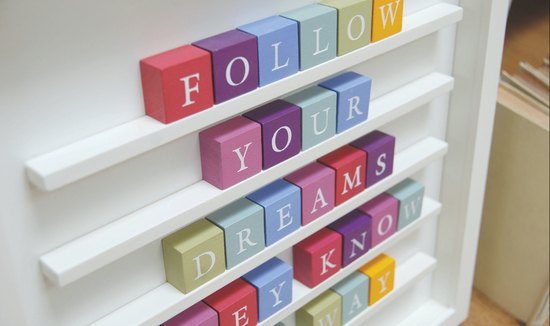 After getting inspiration from vintage toys and more contemporary art they came up with the ABC frame – hand pressed miniature ABC blocks spelling out the child’s name with a personal engraved message. The first one was a huge hit and instantly orders started to come in from friends and family. In 2014 Joe and Amelia decided to go into business full time and have introduced more great products that customers can personalise for their special occasions. Our miniature ABC blocks are hand pressed on our 1960s Dodson Letterpress. 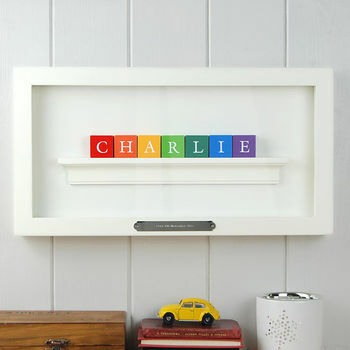 Create personalised name gifts, family name frames or use any other words or phrases to create a special piece just for you - Make It With Words! We are proud members of the Design & Crafts Council of Ireland and all products are made with care and attention in our Dublin workshop. "Great quality and looks fantastic in the nursery. Wife super chuffed!" "Very high standard of product, was really impressed. No problems at all." "Beautiful item. Just as ordered. Excellent quality and beautifully wrapped." "Bought this as a Christening gift for my friends daughter. Its beautiful and she loved it. Also arrived in a gift box which was a nice tough." 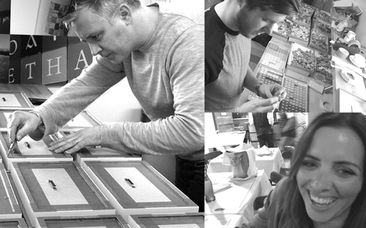 We aim to deliver the majority of our products within 3/4 working days (UK and Ireland Only). Please check the delivery lead time indicated on each individual product description, as these may differ slightly based on the product specifications and personalisation requirements. If you have a specific date you require your item for, please contact us and we will do our very best to get your product to you on time. If for any reason a longer dispatch time is going to be experienced, you will be contacted immediately. All framed pieces are sent using a tracked courier service which will require a signature on delivery, therefore please indicate a MOBILE telephone number which our courier can use to get hold of you if needed on delivery.